The Mayor of Causeway Coast and Glens Borough Council has congratulated local recipients of The William Keown Trust Prestige Access Award. It has been presented to the owners of Station Blue, an accessible self-catering bungalow in Portstewart, and the First Trust Bank in Coleraine. Councillor Brenda Chivers recently visited both locations to congratulate those involved. Speaking afterwards the Mayor said: “I am very pleased to see that these two service providers have been recognised for their commitment to creating premises which are welcoming and accessible to all. The First Trust completed refurbishment work last year which included the installation of motion sensor automatic double doors and a modern platform lift. The interior of the building includes colour contrasting finishes to aid customers with visual impairment along with a lowered banking counter. Station Blue, located at Station Road in Portstewart, is a contemporary four bedroom holiday let which has been specifically adapted to suit wheelchair users. 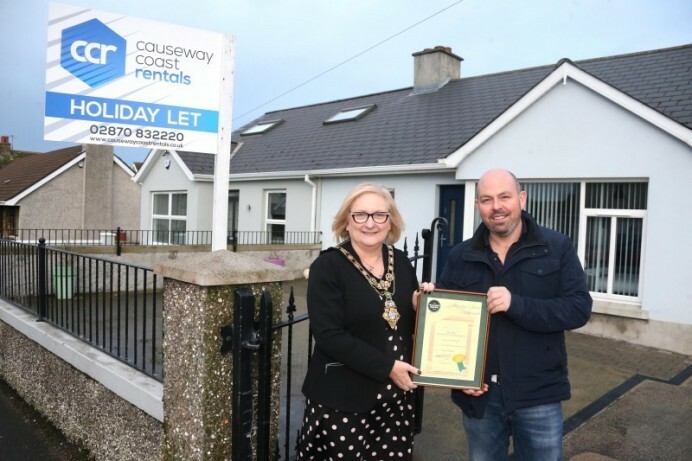 Keith Walls of Causeway Coast Rentals, owner of Station Blue self-catering bungalow in Portstewart, displays the William Keown Prestige Access Award with the Mayor of Causeway Coast and Glens Borough Council Councillor Brenda Chivers.